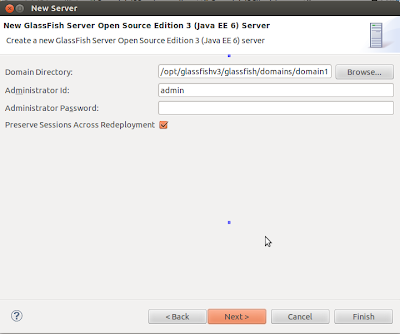 Before trying this out make sure you have installed GlassFish in your machine. Installation is just easy as downloading the zip archive from here and unzipping it to a desired location. 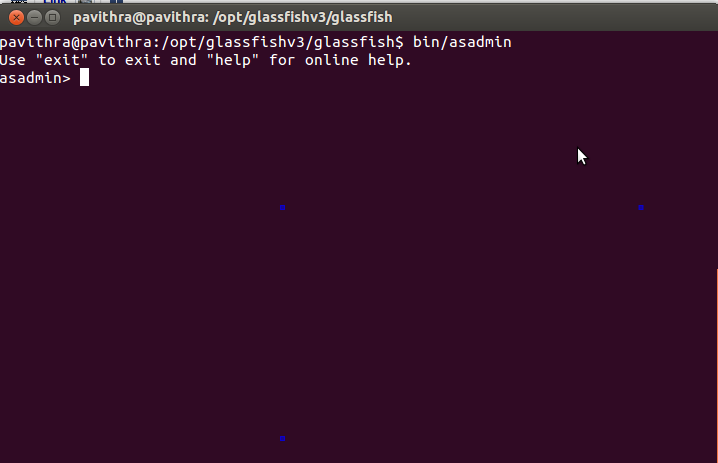 Open up a terminal, change directory to the GlassFish installation directory and run following. This will enable you to use asadmin tool. Now execute the following command to create a new domain. 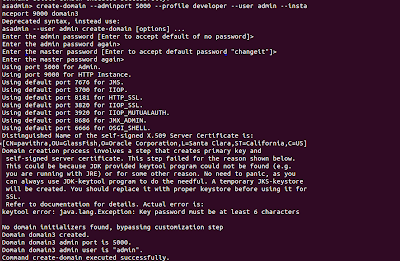 after running this command you will probably have to give admin password and master password. 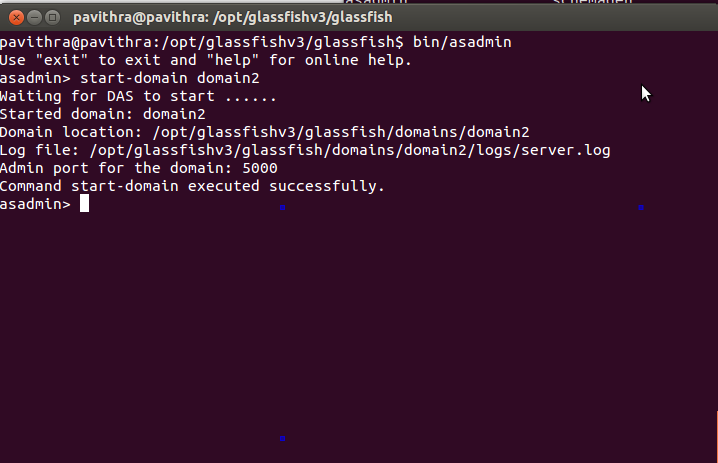 Now open up another terminal and change directory to [glassfish-installation]/domains/ and you will see the newly created domain2 has appeared there. 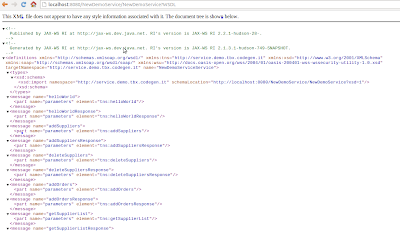 Open up a browser and go to http://localhost:5000/. 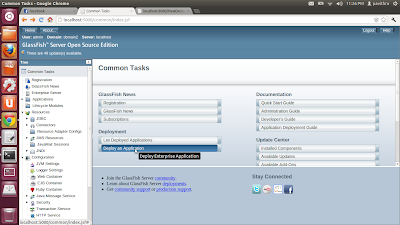 This will bring you the GlassFish GUI admin console. This is one place you can deploy your war file. But in this post I'm not much focusing on it, instead I will show you how to do this using the command line. 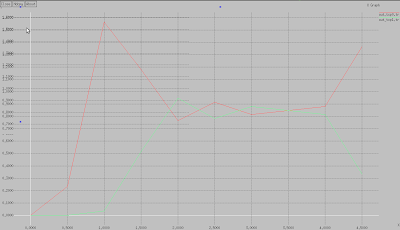 But GUI lovers, for any consolation I have put some screenshots which you can follow if you prefer the GUI way. In case you want to delete a domain use the following command. 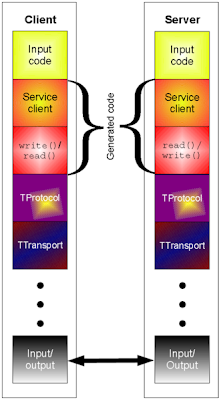 To start domain2 run following command. Use the following command to deploy your war file. 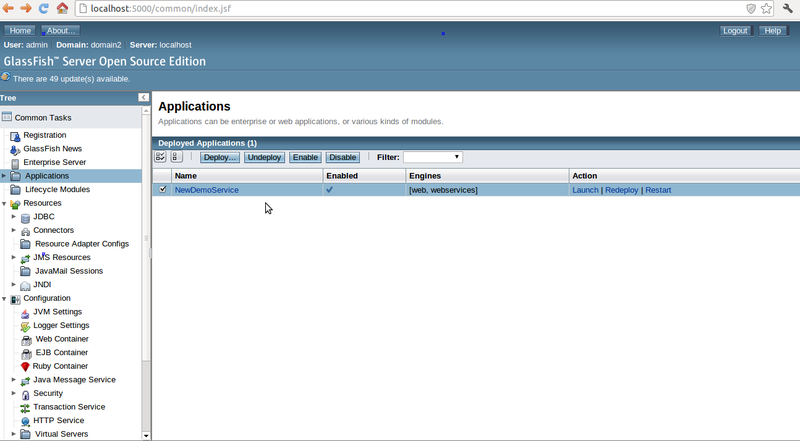 To change default 8080 (HTTP) port which specifies where the web application context roots are available for a Web browser to connect to, you can use the --instanceport parameter when creating the domain. 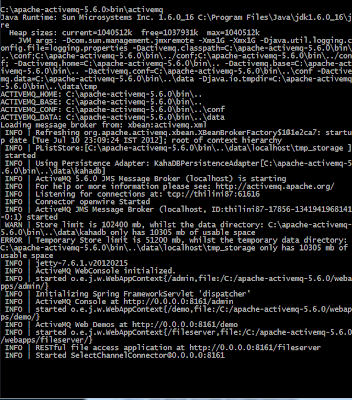 See the following command. 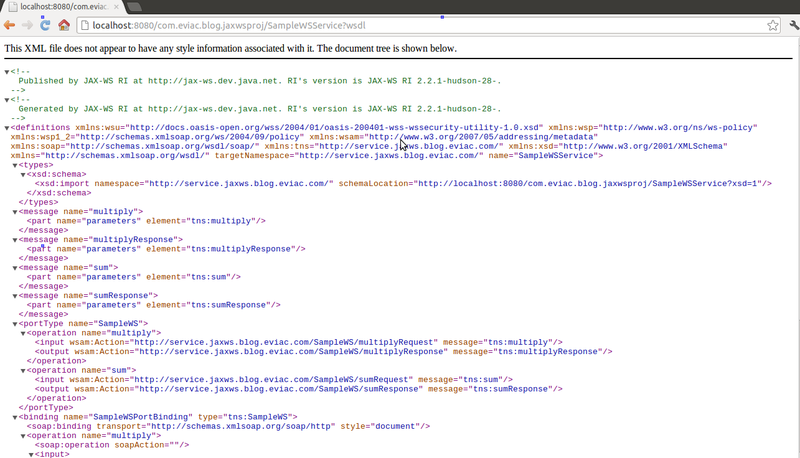 To undeploy NewDemoService.war file you need to use the following command. Note that here you don't have to use the full name but literal "NewDemoService". To stop the domain "domain2" use the following command. After this if you try to deploy to this particular domain, it will complain. 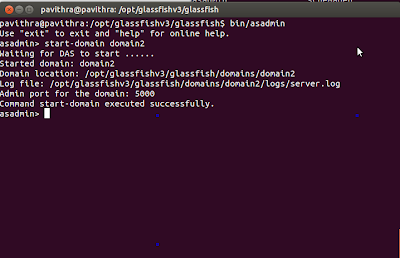 To perform auto deploy, copy NewDemoService.war file in to [glassfish-installation-directory]/domains/domain2/autodeploy directory. 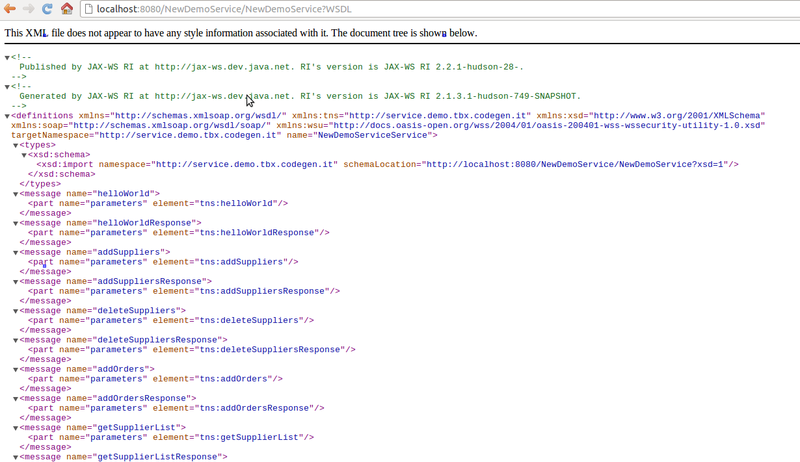 If autodeploy succeeds, you will see NewDemoService.war_deployed has created. This will deploy your war file automatically. 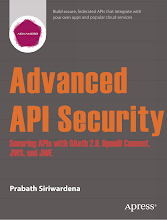 JAX-WS stands for Java API for XML Web Services. 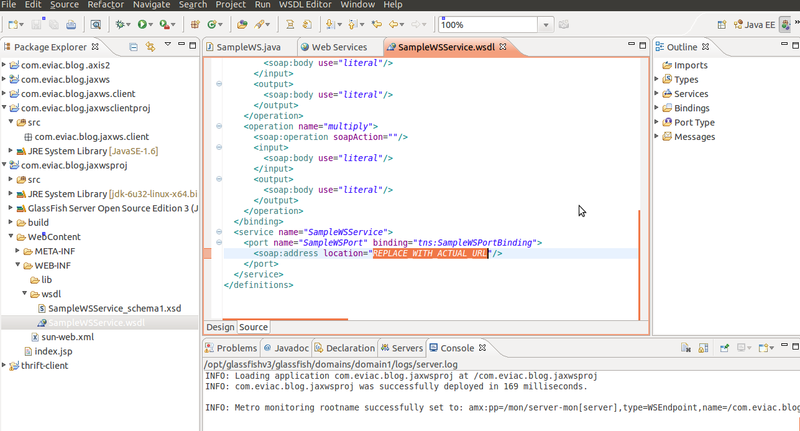 It is a Java programming language API for creating web services and clients that communicate using XML. This post is a quick start for JAX-WS. 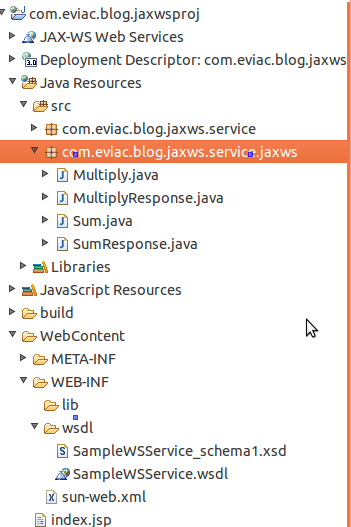 In Eclipse create a Dynamic Web Project called "com.eviac.blog.jaxwsproj". 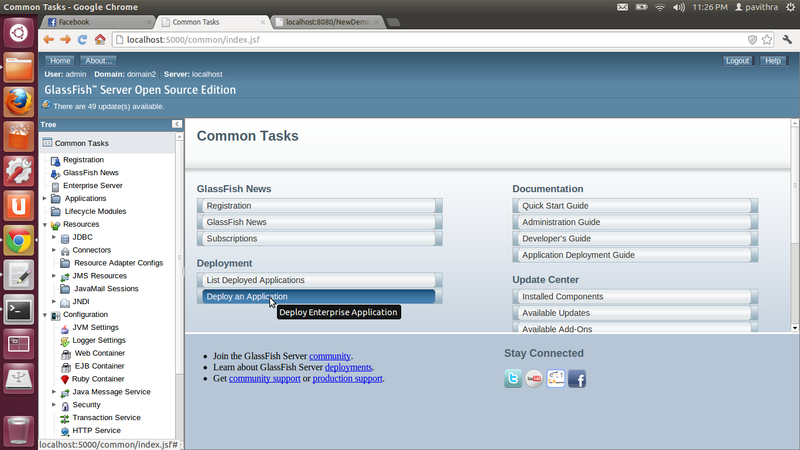 Make GlassFish as the Target Runtime. Create a new class called "SampleWS" in the created project. This will be the implementation class of the web service. 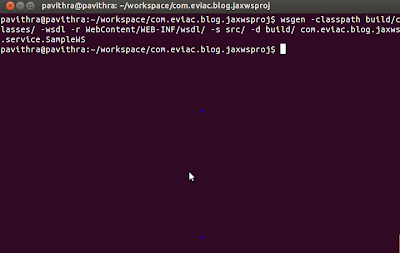 Open a terminal and navigate to the root of the project directory. 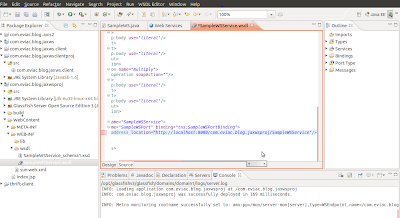 Create a directory called wsdl inside WebContent/WEB-INF/. 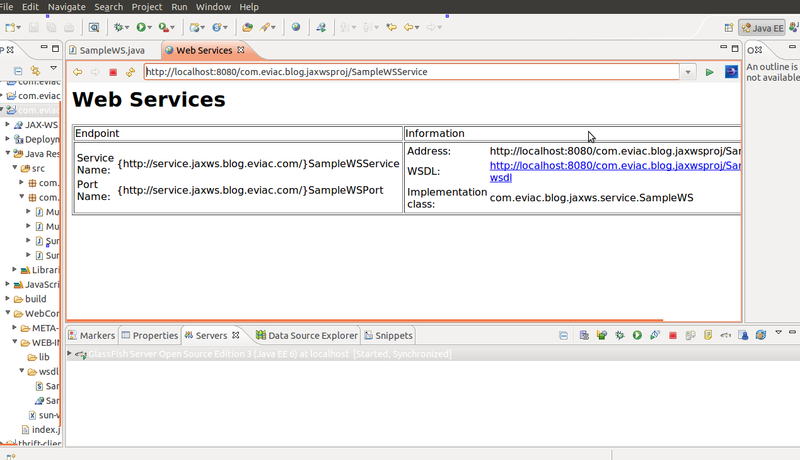 Use the following command to create web service artifacts. 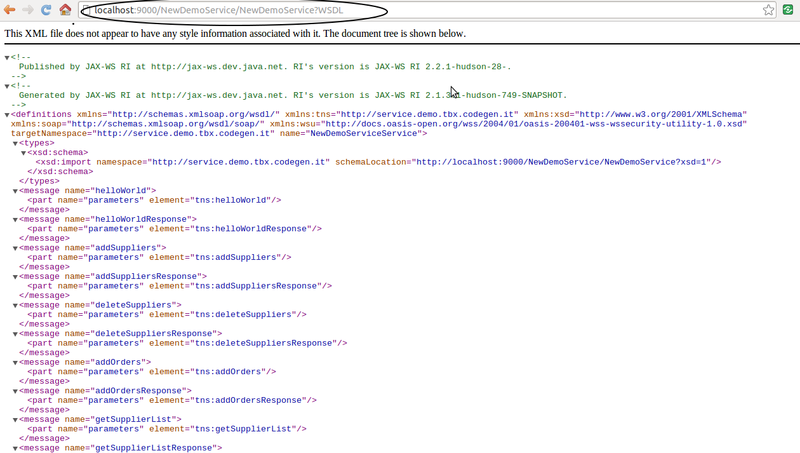 Make sure your JAVA_ HOME is set properly or this command will not work. 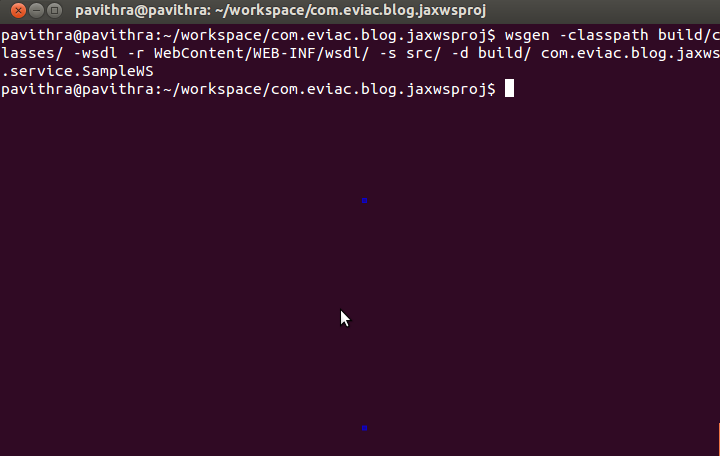 Also make sure to build the project before running this command or it will complain class not found. Refresh the project to discover created artifacts. 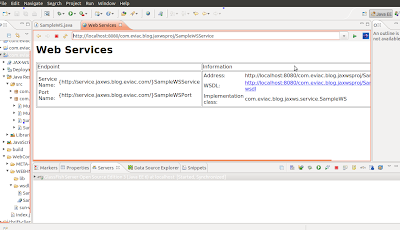 Open the created WSDL-file inside wsdl folder. 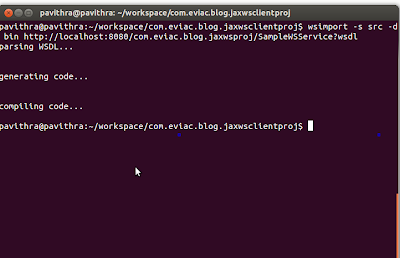 Search for REPLACE_WITH_ACTUAL_URL and replace it with the web service URL: http://localhost:8080/com.eviac.blog.jaxwsproj/SampleWSService, and save the file. 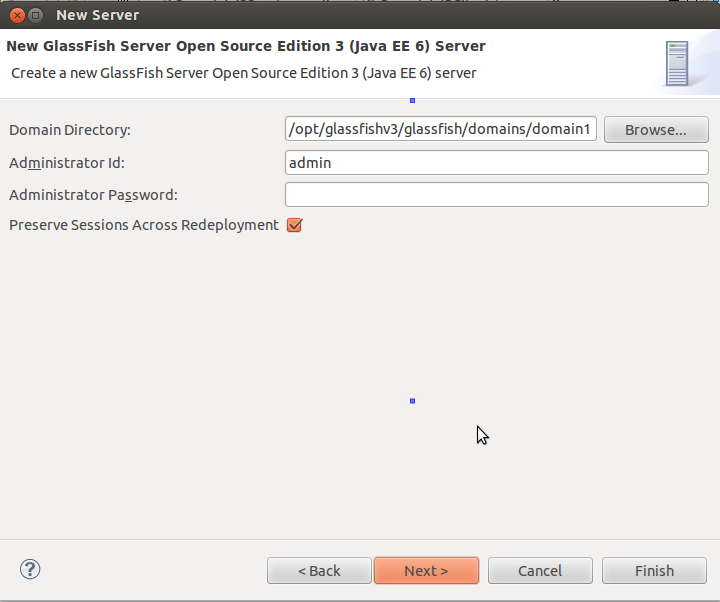 Deploy the project in Glassfish by right-clicking the project, click Run As -> Run on Server and select the Glassfish server. 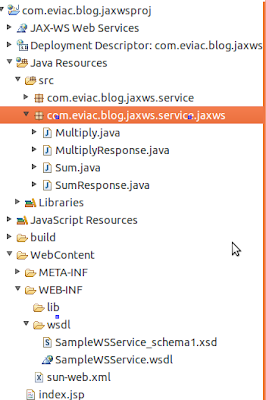 Create a Java project in eclipse called "com.eviac.blog.jaxwsclientproj". 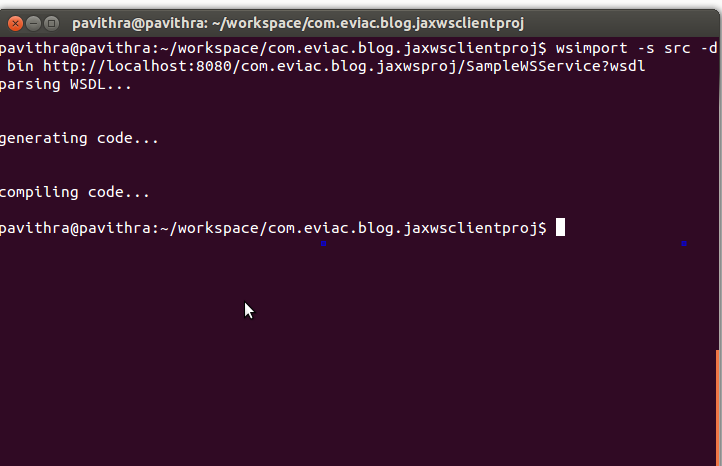 Open up a new terminal and go to the project root. 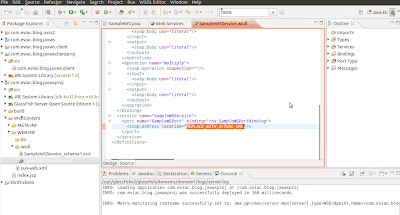 Use the following command to generate the classes you need to access the web service. 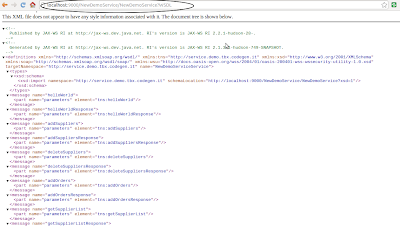 Here you will need to use the URL of the WSDL file. 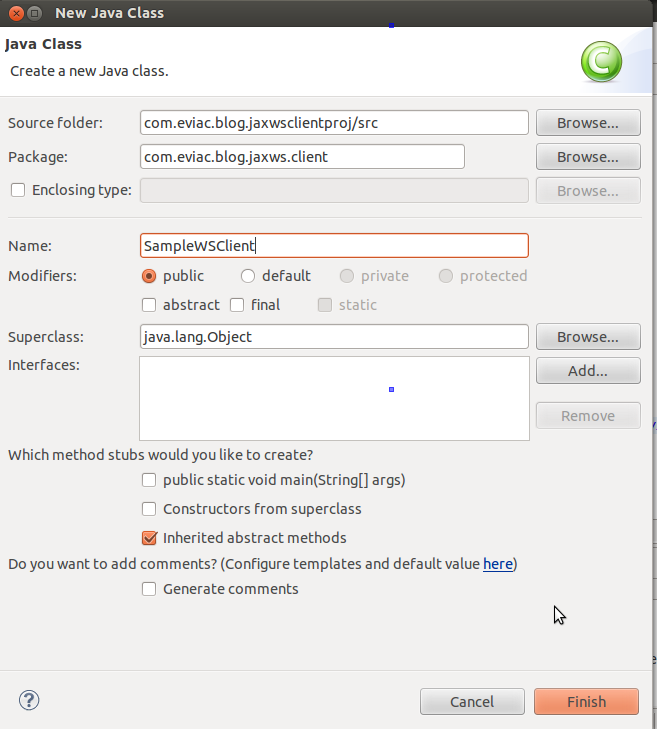 Create a new class called "SampleWSClient" in the project. Right click on the project and click on Run As -> Java Application. 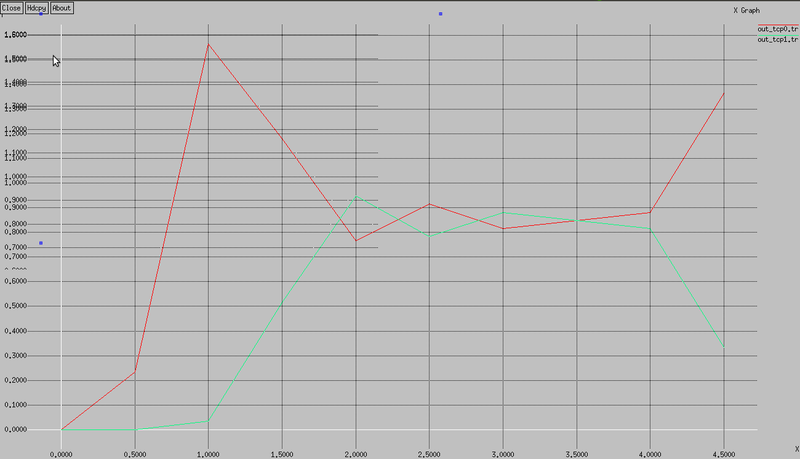 This will result following. 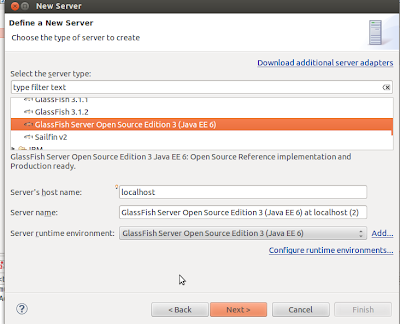 This post will guide you to integrate GlassFish 3.0.1 with Eclipse 3.7. 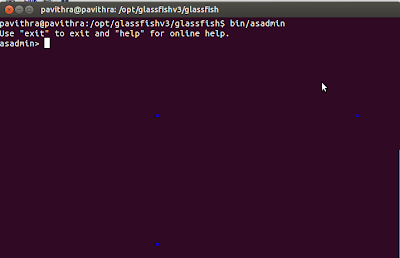 Download the zip archive for GlassFish from here. Unzip it using the following command. 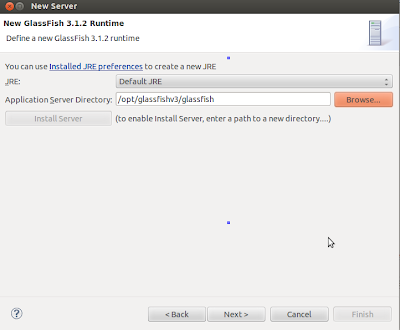 Move GlassFish installation directory to a more suitable place. 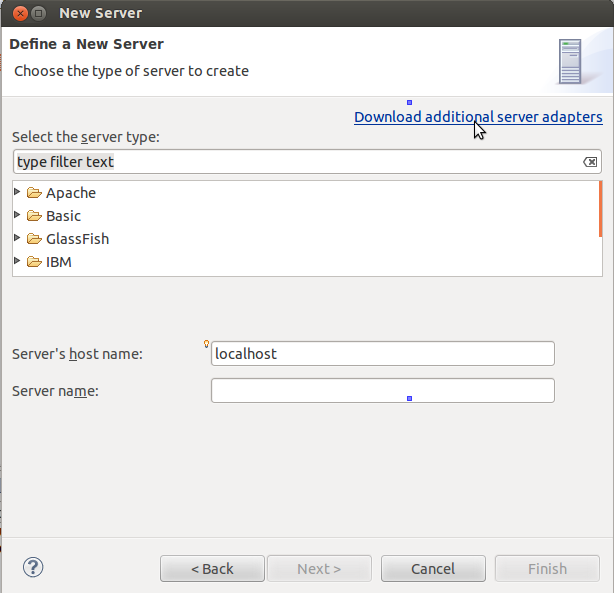 Navigate to New -> Server and click on download additional server adapters link and install Oracle GlassFish server tools. 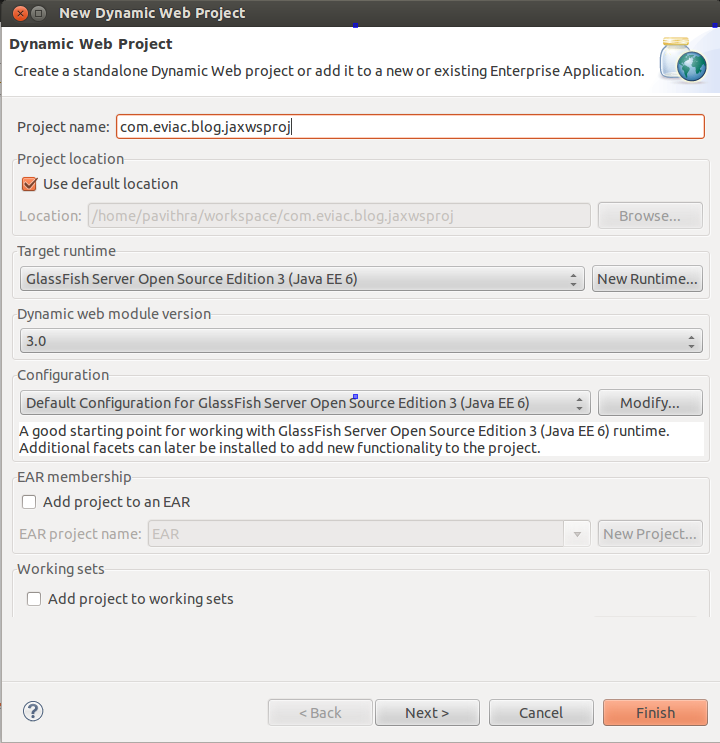 Restart Eclipse, when the installation is finished. 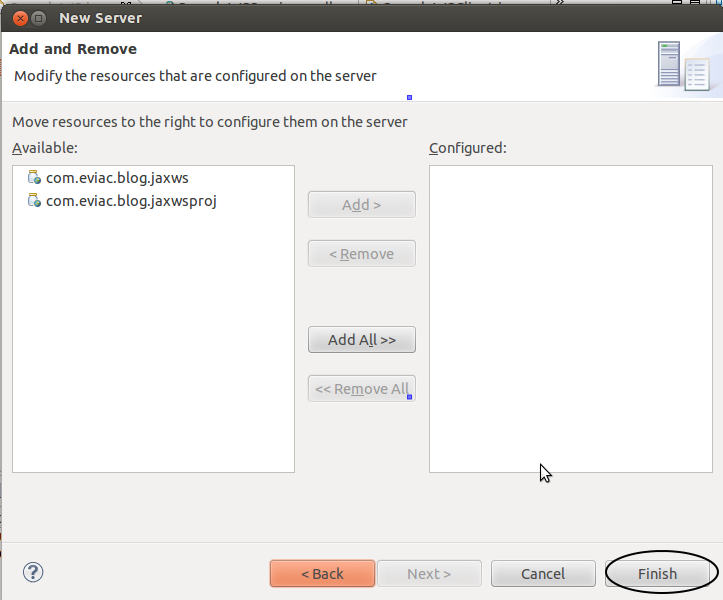 After restarting Eclipse, navigate to New -> server. Select GlassFish Server Open Source Edition 3 (Java EE 6) and click next. 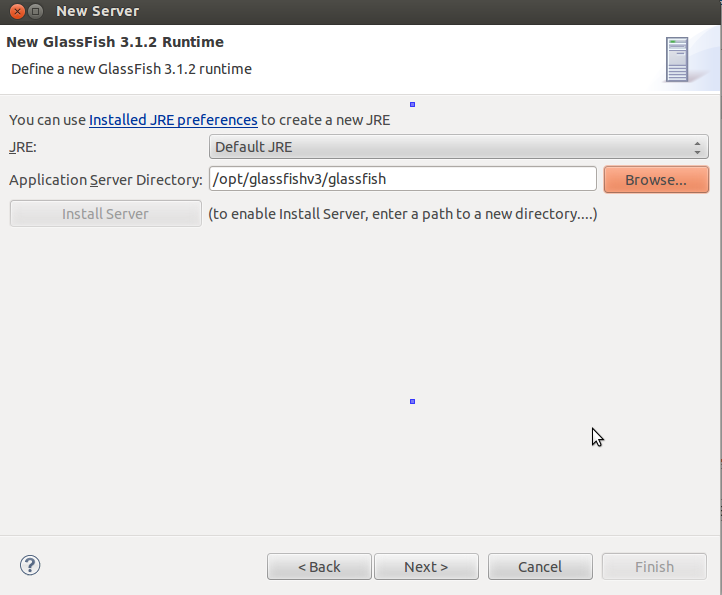 Select a working JRE environment, select the installation path of your Glassfish application server and click next. In this screen keep the default settings and click next. 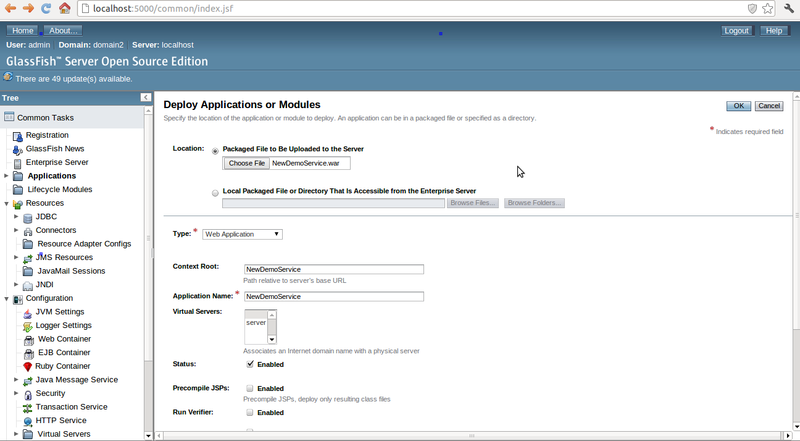 In this screen it lets you select existing projects to be added to the newly configured server adapter, just click Finish. After a successful configuration, server adapter will be appeared in the servers tab. Start the server by right-clicking on it. 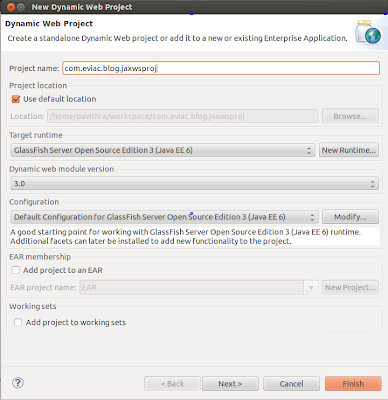 This post is about installing Apache Tomcat7 on Ubuntu 12.04. Before this installation make sure java is installed in your machine. You can refer this post if you haven't done that already. 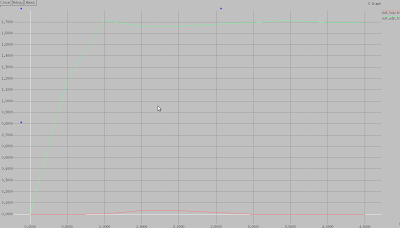 Download Tomcat 7 tar.gz binary distribution from here. 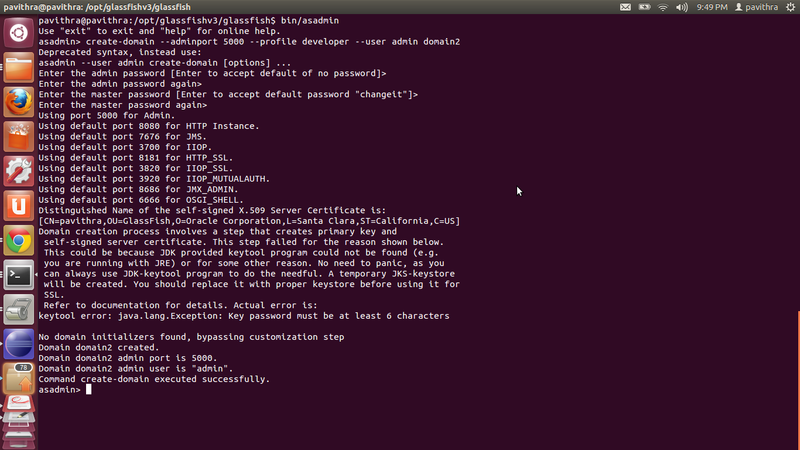 Unpack it using following command. Move it to a more appropriate location using following command. 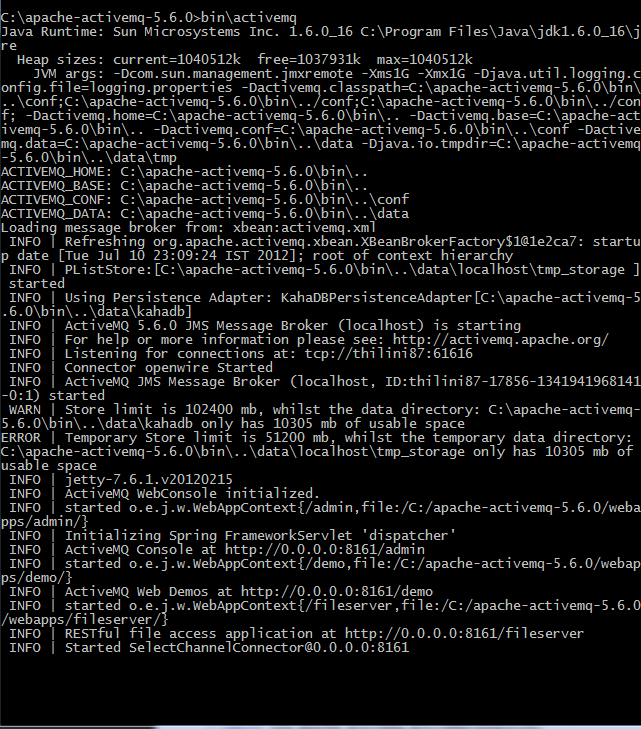 Open up /usr/share/tomcat7/conf/tomcat-users.xml and uncomment user and role entries there. 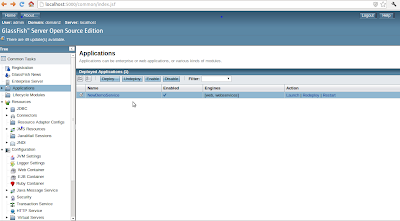 Then add a manager-gui role and a user by adding following lines there. 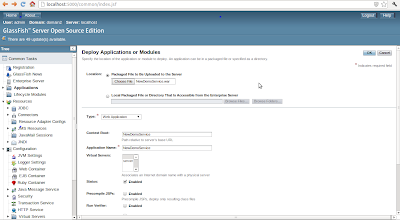 Verify Tomcat installation using the following URL. 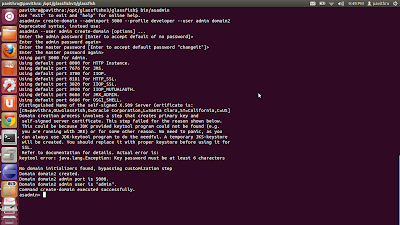 To login as the manager, use the following URL, provide the relevant username and password. OS name: "linux", version: "3.2.0-27-generic", arch: "amd64", family: "unix"
LaTeX is a markup language for describing a document. It can also be defined as a document preparation system. LaTeX is mainly used to create technical or scientific articles, papers, reports, books or PhD thesis. There are number of LaTeX distributions you can install on Ubuntu. One such distribution is TeX Live. To install Tex Live LaTeX distribution on ubuntu use the following command. To edit LaTeX documents we need an editor. 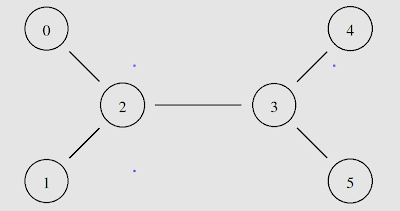 There are number of LaTeX editors you can find. I recommend Texmaker, a cross platform LaTeX editor. 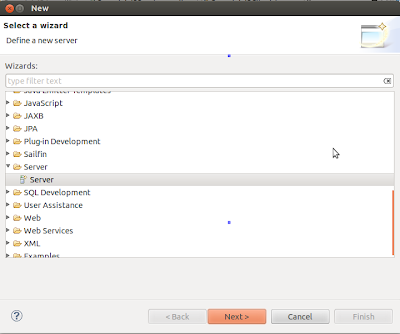 To install Texmaker on Ubuntu use following command. 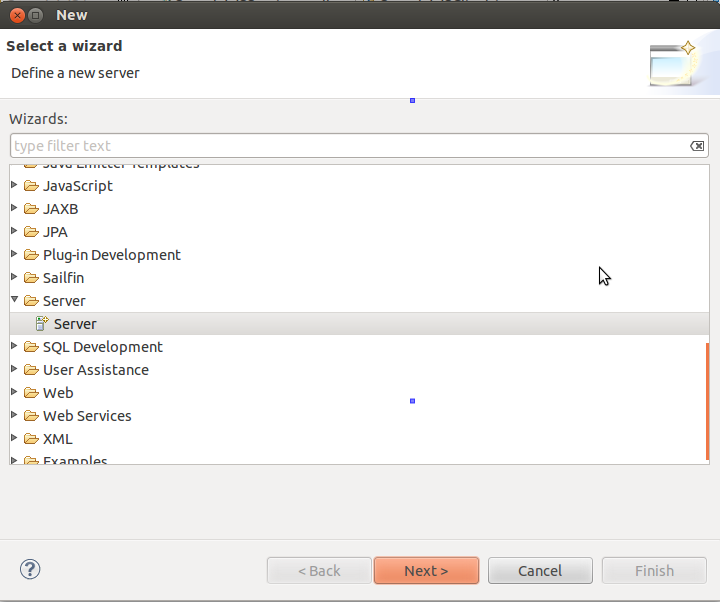 To open Texmaker on Ubuntu use following command. Now Let's create a simple document using Texmaker. Click on File -> New and insert following lines in the blank document. 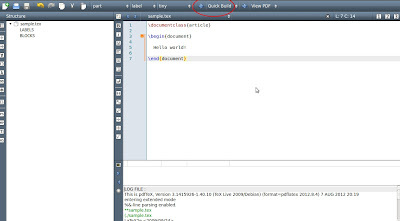 Now save the document as a 'tex' file by clicking File -> Save. Compile the document clicking the arrow Quick Build. 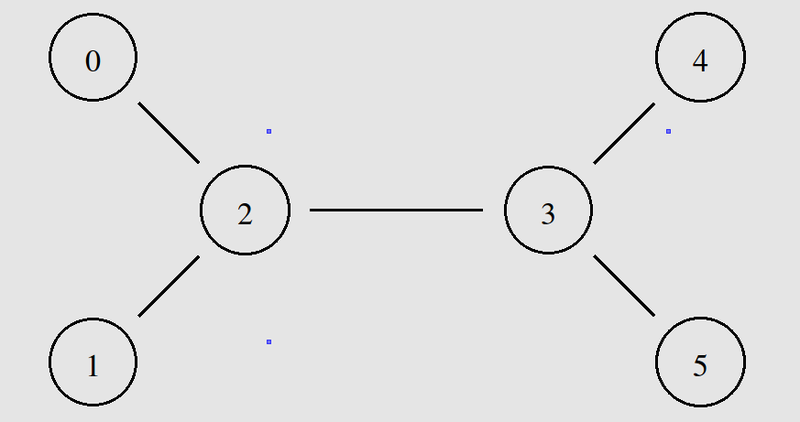 You can learn more about LaTeX by refferring this link. In a previous post I wrote how to install Apache thrift on Windows. In this post I will guide you how to install Apache Thrift on Ubuntu 12.04. If you have already installed Ubuntu 12.04 you probably have realized that Sun java(oracle java) does not come prepacked with Ubuntu like it used to be , instead OpenJDK comes with it. 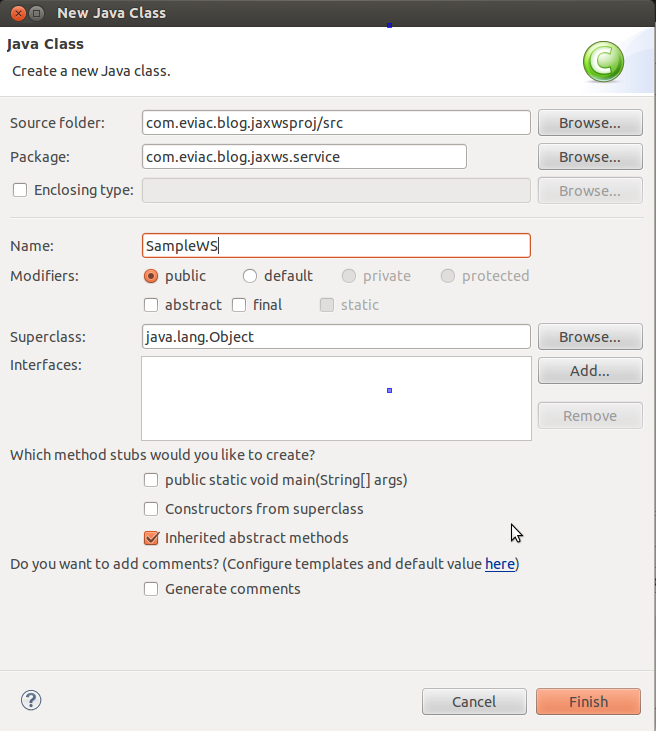 Here is how you can install Oracle java on Ubuntu 12.04 manually. 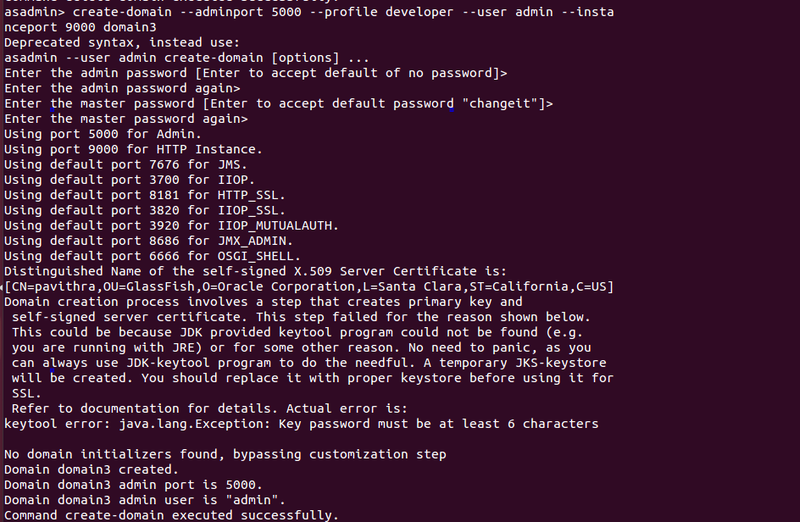 Download jdk-6u32-linux-x64.bin from this link. 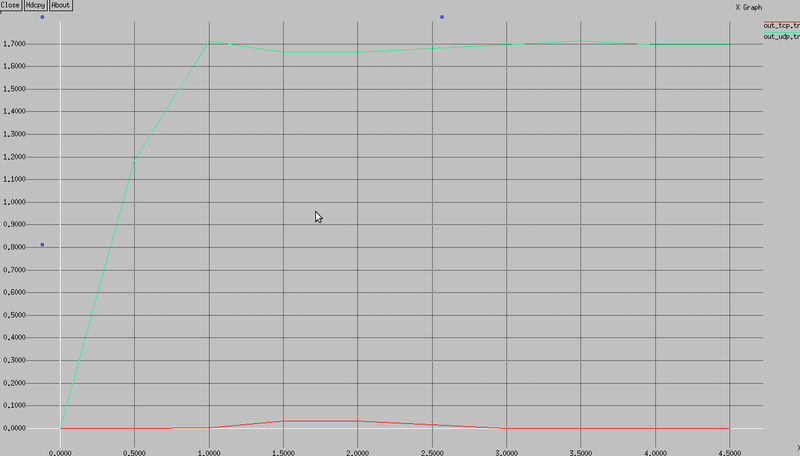 If you have used 32-bit Ubuntu installation, download jdk-6u32-linux-x32.bin instead. 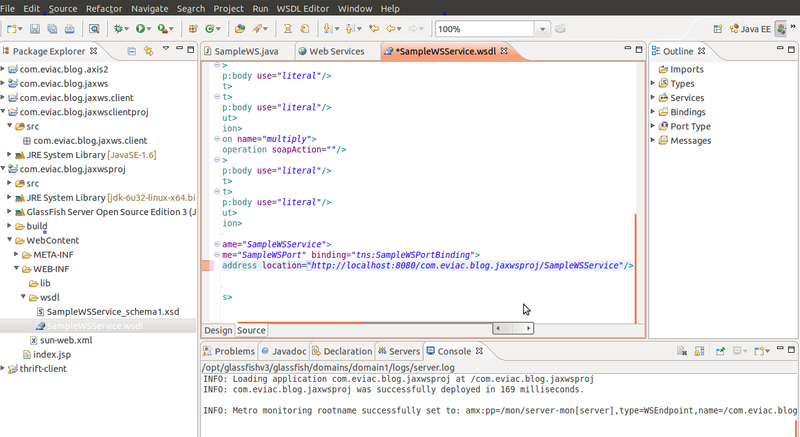 After doing that open up a new terminal and run following commands to verify JAVA_HOME has set correctly.